I am taking a quick break from my blogging sabbatical to let you know about a great show that we have coming up on May 7th and 8th. If you live in the Southern California area or will be in town for Mother's Day, you won't want to miss this. Unique LA boasts 300+ vendors of locally made goods and all the booths are a feast for the eyes. We had such a great time at the Holiday Show, you can see a pic of our booth below. So, hold off buying your Mother's day gifts and find something "unique" for your mom at the show. We will be offering complimentary gift wrapping when you buy something at our booth. Vintage always makes for a special one of a kind gift and we will have lots of jewelry and purses, which make great gifts for mom. We accept credit cards for all purchases. The tickets to the show are $10 and free drinks are served. 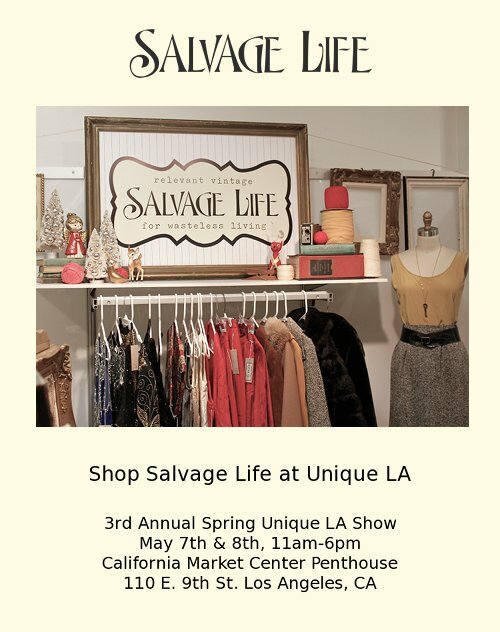 To learn more about the show, click HERE to visit the Unique LA website.